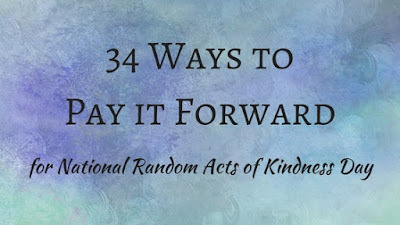 Today is National Random Acts of Kindness Day and since my birthday in late October I have been on a mission to complete 33 Random Acts of Kindness in honor of my 33rd Birthday, and I am proud to say that I have completed 34 as of today! Brought donuts to co-workers (I brought a couple boxes to the shop for all of our employees on the farm). Brought donuts to church staff and volunteers (I guess I love spreading smiles through donuts...). Donated to a friend's Facebook non-profit support campaign. Donated books to local Little Free Library. Sent gas card to family traveling for cancer treatments with a thinking of you card. Participated in a birthday card shower for a friend's mother. Brought flowers to great-aunt just because. Donated board games to nursing home. Brought donuts to nurses and staff taking care of loved one in the hospital (there I go again with the donuts...). Wrote a note to the hospital sharing about individuals who gave outstanding care to loved one while in the hospital. Dropped off food to a family with a new baby. Gave my Fleet Farm Black Friday stuffed animal to woman who wanted one but didn't arrive early enough to get one herself. Donated to every Red Kettle I walked by during the holidays. Sent Advent devotions to a couple of friends. Donated toys to Operation Santa drive. Supported friends who had Giving Tuesday Facebook campaigns. Set out drinks and snacks for delivery drivers at house during holiday season. Participated in my children's school's food drive. Paid overdrawn school lunch account for a family at my children's school. Sponsored a local family in need over the holidays. Donated items to the Ronald McDonald House through local McDonald's giving tree. Donated hams to a couple local families in need through La Luz Hispana and Hams Across America. Sent thinking of you card to friend. Left positive reviews for three businesses online. Ordered champagne for two people I saw get engaged. Helped a friend's cousin with getting settled in new home after going through some hard times by donating some house supplies. Left positive review for resort that we visited on our anniversary trip. Participated in National Wear Red Day to bring awareness to women's heart disease. Supported friend's Cookies for Kids Cancer campaign. Donated to local grocery store's MDA campaign. Left Valentines in public restrooms wishing everyone who saw the hearts a great day. Donated to a family's medical/health issues Go Fund Me account. So I encourage you to step out of your comfort zone and celebrate National Random Acts of Kindness Day. Be sure to comment and let me know what you did to celebrate, or share ideas so we all can pay it forward. And remember to Comment for a Cause. Love it! This week I carried Valentines candy as I traveled taking time to offer it to TSAs, shuttle drivers, gate agents, flight attendants, the random folks sitting next to me and more. Feels so good! Love this! Holidays are a great way and time to do random acts of kindness. You have such a generous spirit and I love it. I also love how you love with donuts, a woman after my own heart! <3 These are all such great ideas, Val! Thank you Carlee! And I mean, who doesn't love getting donuts! Love this list!! I definitely want to do more random acts of kindness and include my kids. Love that! You've inspired me to write a new list later about how to pay it forward with your kids! Sent hand written thank you notes to anyone who has done something special for me, collected/donated new, packaged socks, underwear, pj's to our local battered woman's shelter, sent "Thinking of You" cards to a friend who's husband is going though cancer treatments, participated in "I Found A Quilted Heart" program. Each week I try to do something special for someone!! I love all of those ideas and I'm going to have to check out the "I Found A Quilted Heart" program! Such great ideas, Val. I try to do little things along the way like you do and there is always something that pops up that makes me know that it is a good idea to be aware of all the opportunities out there (big and small) that help to make a difference. My Lenten letters are a big part of acknowledging that someone means something to me and those are my focus right now. I love your Lenten letters tradition - such a thoughtful gesture.